We left Barbate at noon to get the best from the currents that flow for 9 out of 12 hours into the Med. The visibility was very good so soon after leaving we got our first glimpse of Africa – very exciting. 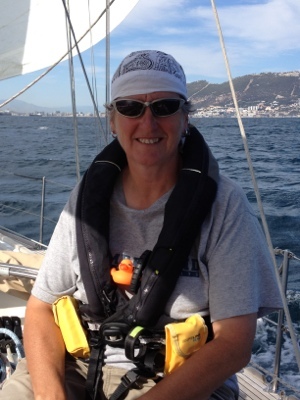 The winds were quite light so we motor sailed for most of the journey rounding Tarifa point in winds less than 10 knots. This is very unusual as they have winds over 30 knots for 300 days a year! We finally managed to sail just after that for the last two hours and were yet again blessed with lots of dolphins playing in our bow wave and welcoming us to Gibraltar. We refuelled as diesel is only 92 pence a litre and then went into our berth. It is Med style mooring here with two stern lines (from the back of the boat) attached to metal rings on the concrete quay and then a lazy line you attach to the bow (front of the boat). Not easy in confined space with 16 knots of wind from the side. Also, with this style of mooring, you usually have very little change in tidal height but there is about 1 metre here so that is quite a drop when you’re trying to get off the boat from the back! We are staying here for the rest of the week to get some minor repairs done as well as boat chores such as washing whilst we wait for Lee and Jase to arrive from the UK before setting off for the Balearics. 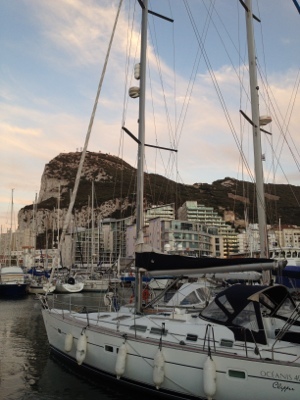 This entry was posted in News and tagged 2012, Gibraltar. Bookmark the permalink. I think you have sent us the winds you were talking about. It is horrendous here today. We are living on the boat for a couple of days while our french friends are here and then we are off to England on Friday.